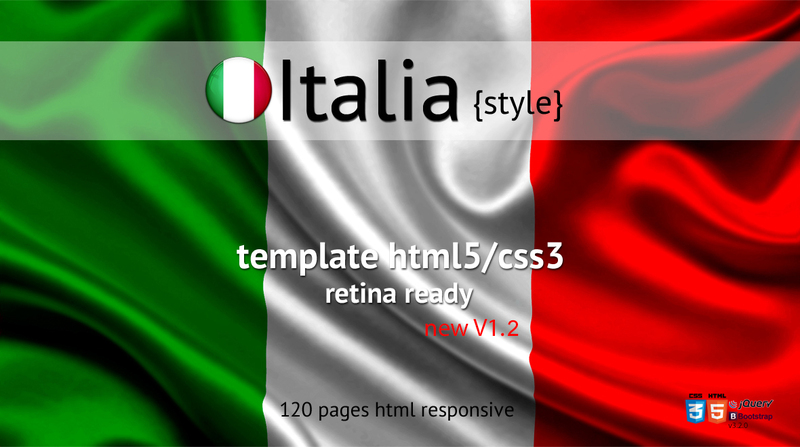 Italia Template Retina Ready consists of over 120 pages html5 using the whole technoligy available today. We wanted to limit as much as possible to use plugins outside of the one offering the bootstrap. The site can be used for any type of business, or social services through a range of options for each type of page . There are plenty of new features such as page (my personal page) can be used for example for a personal blog , the various options of pages devoted to pages for individual projects or portfolios. Even the blog section provides an endless possibility of options you can freely customize and tailor to your specific needs. Particular attention has been paid to the pages and e-commerce with a wide choice of options. It was also decided to add a section of the site completely different (one page web site) to provide endless options for the end user. The Italia Template uses the famous framework Bootstrap in the latest version 3.2.0 and icons exploits useful platform Font Awesome it even in the latestversion 4.2.0 . I hope this template is to your liking and do not hesitate to contact me for any questions or clarification.